This antibody is expected to recognise isoform 1 ( NP_000572.2) only. Human Liver and kidney lysates. Our Abpromise guarantee covers the use of ab50427 in the following tested applications. IHC-Fr Use a concentration of 20 µg/ml. IHC-P Use a concentration of 3 - 5 µg/ml. WB Use a concentration of 1 - 3 µg/ml. Detects a band of approximately 22 kDa (predicted molecular weight: 22 kDa). ELISA Use at an assay dependent concentration. Antibody detection limit dilution 1:32,000. Protects the hemoglobin in erythrocytes from oxidative breakdown. Belongs to the glutathione peroxidase family. 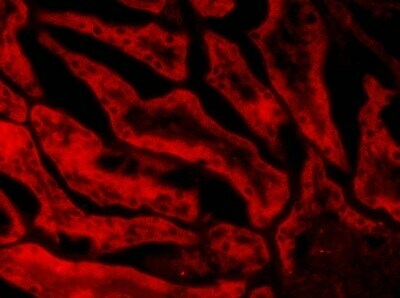 Anti-Glutathione Peroxidase 1 antibody (ab50427) at 1 µg/ml + Human Liver lysate (35µg protein in RIPA buffer). ab50427 (20µg/ml) staining of PFA-perfused cryosection of Porcin Kidney following microwave antigen retrieval with citrate buffer pH 3 and CY3-staining shows staining of cytoplasm in PCT epithelial cells. ab50437 at 3µg/ml staining Glutathione Perxidase 1 in human cerebral cortex by Immunohistochemistry (Formalin/ PFA-fixed paraffin-embedded tissue sections). The tissue underwent antigen retrieval by steam in citrate buffer pH 6.0. The AP staining procedure was used for staining. Publishing research using ab50427? Please let us know so that we can cite the reference in this datasheet. There are currently no Customer reviews or Questions for ab50427.